The Russian space capsule Soyuz was slated to launch on March 29th, but a botched pressure test has delayed the launch until May 15th. 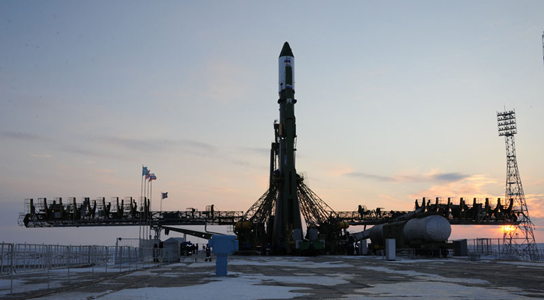 Soyuz will contain the next crew of the ISS, who are anxiously awaiting the launch. One of the three modules that make up the entire Soyuz TMA-04M vehicle has been scrapped after an accident occurred during a test, which caused the capsule to develop a leak in one of its descent rocket thrusters. Since NASA retired their space shuttle fleet last year, Russia’s three-person Soyuz capsules are the only vehicles available to ferry astronauts to the ISS. While NASA hopes to eventually use private US-built spacecraft, those are still years away from being ready. Soyuz joins the unmanned SpaceX Dragon capsule in dry dock, which was due to launch on February 7th. The vehicle requires more testing and some minor fixes. The earliest it will launch is on March 20th. Soyuz will carry NASA astronaut Joe Acaba and Russian cosmonauts Gennady Padalka and Sergei Revin to being long-duration stays on board the ISS. They were going to replace NASA astronaut Dan Burbank and Russian cosmonauts Anton Shkaplerov and Anatoly Ivanishin, who will now stay aboard the ISS until April 30th. Elevated pressure caused deformations on some parts of the spacecraft, prompting a weakening of some of its welding joints. The spacecraft wasn’t designed to handle the pressures in this test and it is unknown what the technical repercussions were on some of the hardware, so it’s been decided to scrap the vehicle altogether and use another Soyuz coming off the assembly line. Be the first to comment on "Botched Pressure Test of Russian Soyuz Capsule Delays Launch by a Month"